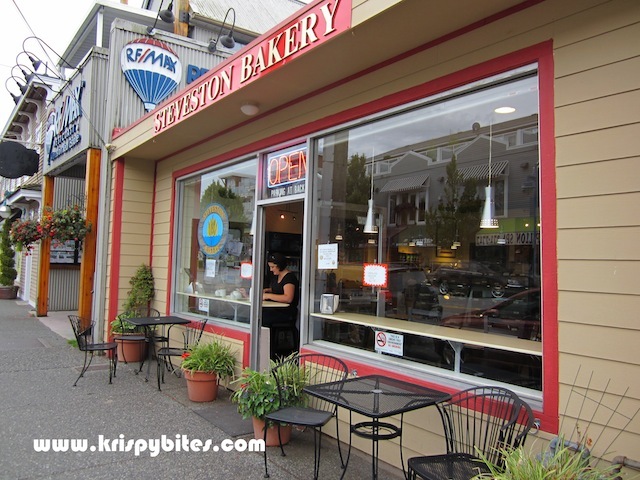 I was in Steveston to pick up some waffles from Damien's and decided to go for a small afternoon snack. 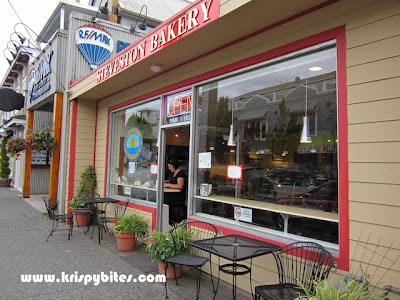 I passed by Steveston Bakery and noticed a small sign taped to the window that read something like "Get a slice of pie for $0.99 with purchase of a regular coffee." It sounded like a good deal, so I went in to ask about details. 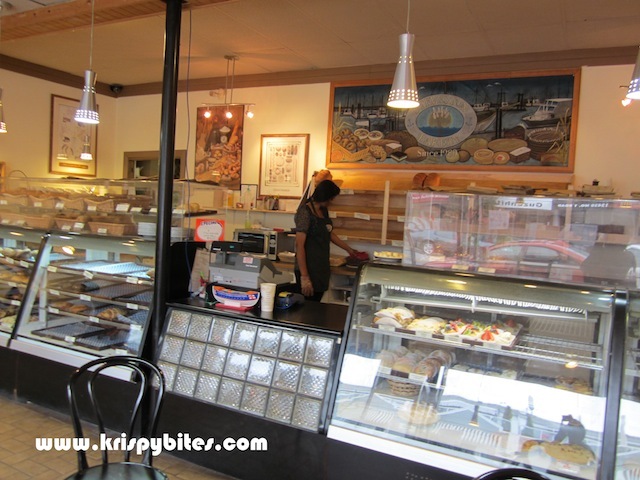 Breads, cakes and other pastries were displayed behind glass counters and on the shelves. I quickly scanned the prices and they seemed pretty cheap, so I decided to get a lemon tart ($1.60) as well. It looked interesting with its uneven homemade crust, but unfortunately the taste was very disappointing. The lemon filling was bland with a barely distinguishable artificial lemon flavour. The crust had the strangest texture that was not flaky or crispy. It looked like a shortbread crust, but tasted like a soggy biscuit that was slightly chewy with no buttery flavour at all. The regular coffee ($1.58) was self-serve with a variety of choices. I opted for an organic blend, but I'm not a fan of brewed coffee, so no comment there. 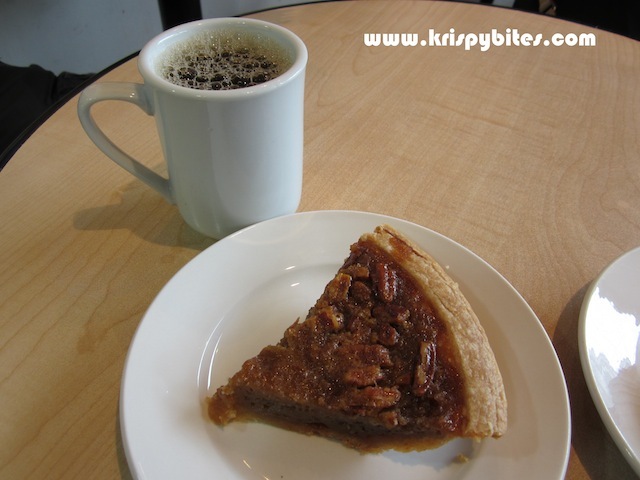 There were 2 choices for the pie ($0.99 with coffee): apple pear, and peach pecan. The peach pecan looked really dark in colour and didn't seem too appealing, but I took it since it was the last slice. Surprisingly it turned out to be really good. 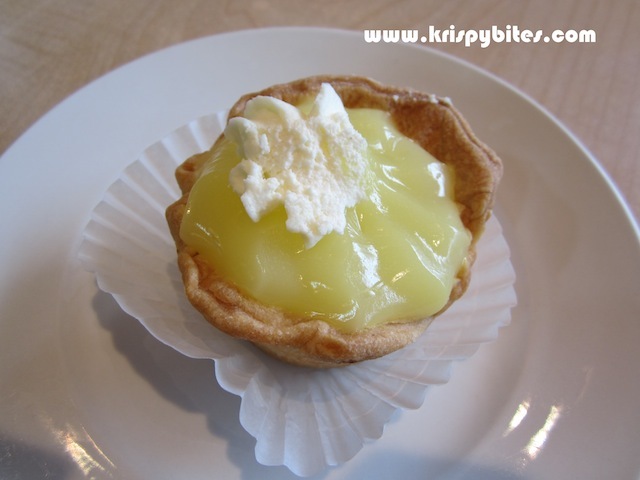 The crust was much nicer than the lemon tart crust and the peach filling was fragrant and chewy. I especially enjoyed the crunchy candied pecans on top. The pie and coffee combo is a really good deal, and it's a good option for a small afternoon snack if you're in the area. Although I had a really bad experience with the lemon tart, the other pastries might not be so bad. I would probably try something else next time since the prices are quite cheap.